Working and productive ranches and farms, abundant wildlife, and beautiful wide-open spaces might seem to be timeless elements of the Colorado landscape, but the state continues to witness increasing development pressures, particularly over water resources. By 2050, Colorado is expected to double its population size. While growth has benefits, to the San Isabel region the costs are significant, particularly through the sub-division and drying up of productive, irrigated agricultural lands. Agriculture and tourism are two of Colorado’s most important economic sectors, and both depend on a healthy, intact and beautiful landscape. If we don’t take responsible action now the consequences will be great. Agriculture is our heritage and critical for our future. 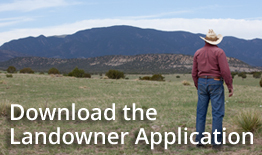 Colorado loses approximately 30,000 acres of agricultural land each year. The protection of farms and ranches is essential to maintaining a secure source of food for a growing population. When lands are transferred or sold, their futures can be in jeopardy. With the average age of ranchers and farmers rising every year, it is vital to our mission that we keep our agricultural lands production. For families who wish to continue their legacy of ranching and farming, it is vital that they discuss and plan for their succession. Keeping water on the land, in agricultural production. Our region’s agricultural water rights are a primary target for growth on the Front Range, and the pressure to sell those rights will only increase in the future. Irrigation is essential to agricultural productivity, and these lush green fields attract wildlife, raise the water table, and create wetlands and riparian areas that are beneficial for humans and animals. A conservation easement generates revenue for landowners and ensures that the water will be preserved on the land in perpetuity. Ensuring connectivity and room for ecosystems to function. Ranch lands are the most biologically productive, diverse, and least fragmented private lands of Colorado, and are an important source of ecosystem services – clean air and water – that benefits all Coloradans. Private lands are essential to sustaining the healthy wildlife populations that provide wildlife viewing, and numerous recreational opportunities such as hunting and fishing. Contact San Isabel Land Protection Trust to help preserve the land for generations to come.